Flamethrowers were gruesome weapons of war and so controversial that the U.S. military stopped using them after Vietnam. But as crazy as it may sound, they are available for sale to the public. 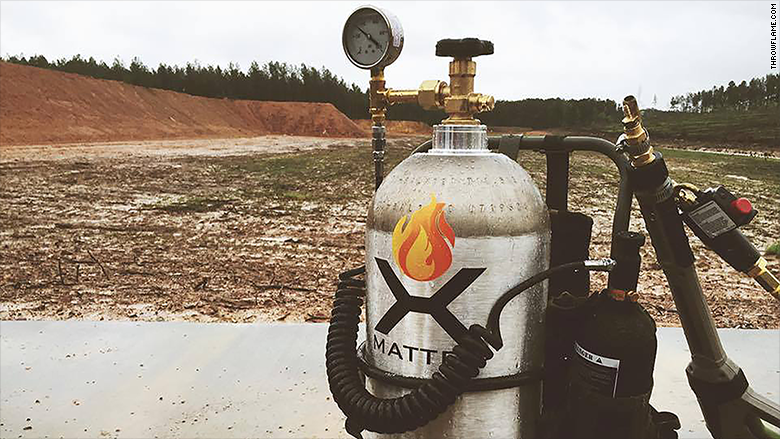 A Cleveland startup called Throwflame is selling flamethrowers for $1,599 that can shoot fire for 50 feet. 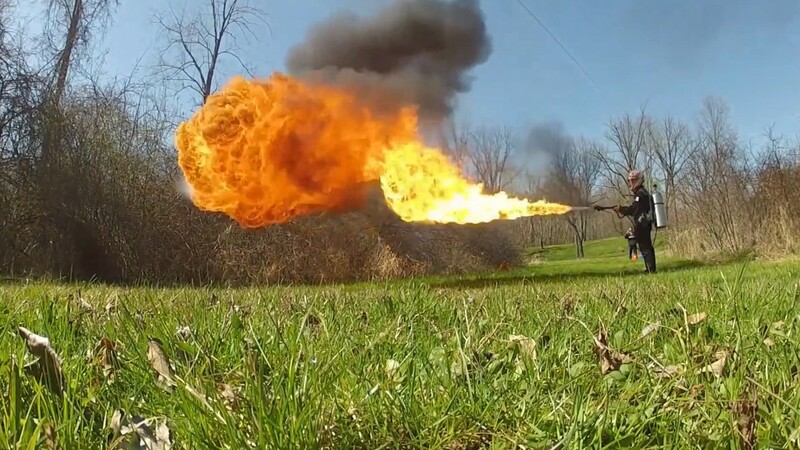 Another company, Ion Productions Team of Detroit, is selling $900 flamethrowers that can eject flames for 25 feet. Both companies started selling them this year. The flamethrowers are marketed not as weapons, but as fun devices. "We always have the people who just want it for fun. Impress the neighbors at the BBQ," said Throwflame founder Quinn Whitehead. Both Whitehead and Ion CEO Chris Byars said their flamethrowers have caused no injuries, and safety is a priority. But Ion notes on its website that the flamethrower "may result in injury or even death." 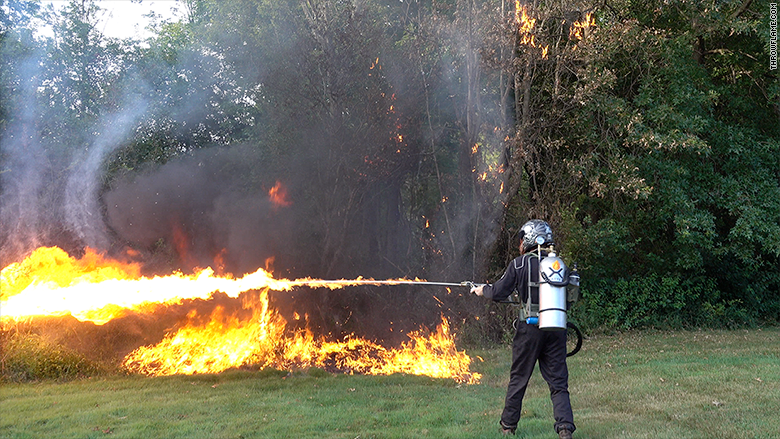 The flamethrowers do have practical uses, both companies told CNNMoney. They said farmers can use them to clear fields by burning unwanted brush, and fire departments can use them for controlled burns, to try and prevent accidental forest fires or to stop them from spreading. Flamethrowers can be used to clear brush. How do they work? Throwflame's fire comes from a hose connected to a backpack with a tank of fuel. The Ion flamethrower is powered by a fuel can that's attached directly to the device. Are flamethrowers legal? A spokesman for the Bureau of Alcohol, Tobacco, Firearms and Explosives said it doesn't regulate them because they are not guns. That means buyers don't need to go through background checks from the FBI. Still, flamethrowers could run afoul of state or local laws. They are banned outright in Maryland. California considers them "destructive devices," which are illegal, but the state does issue permits for use on movie sets. Many other local jurisdictions have fire codes and weapon controls, which could prevent people from buying or using them. There's no outright ban on them in the country's National Parks. However, you cannot use one, and displaying one could result in prosecution for causing "unrest," according to the Parks' regional chief ranger William Reynolds. The Department of the Interior, which controls the Office of Wild Fire, said its firefighters use a variety of incendiary devices, including drip torches, flares and propane torches. While it didn't name a flamethrower, it does use a Terra Torch, which behaves like one. However, it's fueled by a tank mounted in a truck, which isn't portable. Flamethrowers are not known to be regulated by the federal government. But state and local laws apply. Throwflame and Ion sell their flamethrowers online. Byars said he ships via the U.S. Postal Service, which has restrictions against flammable liquids. So he ships them without the fuel. Whitehead said he ships via UPS. Susan Rosenberg, a UPS spokeswoman, confirmed that "a flamethrower device without fuel is not a restricted item and is not licensed in the same way as firearms or ammunition. UPS will accept the device for shipment if legal in the origin and destination locations."